How often do you write a personal check? If you’re like many of the respondents in the latest GOBankingRates poll, never. With the increasing availability of mobile and online banking options, traditional checking account products like paper personal checks are falling out of usage. Online bill pay, peer-to-peer payment apps and other, more convenient ways of moving money are taking their place. In a 2014 poll, GOBankingRates asked how often banking customers wrote personal checks. The most common response was “never” (37.8%), followed by “several times a month” (25.6%), “a few times a year” (20.5%) and “once a month” (16.1%). Men are more likely to never write checks than women. Every single respondent polled making $150,000 and up reported writing checks several times a month. The youngest demographic polled, 18-24, were most likely to never write checks. 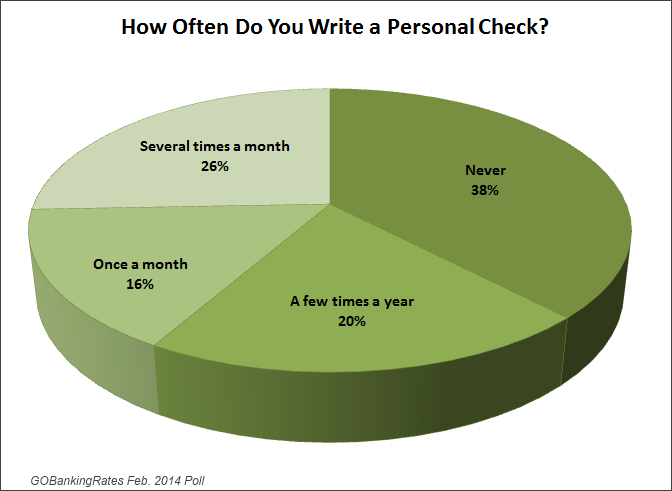 Older respondents were more likely to write checks several times a month. Western respondents were more likely to never write checks than respondents in any other region. Rural respondents were more likely to write checks several times a month than urban and suburban respondents. Indeed, online payment systems have become ubiquitous among banking customers. The Financial Brand reported in October 2013 that research by Fiserv found 60 percent of respondents make a payment via laptop or desktop computer at least once a month, while 30 percent have made a payment using a mobile phone and 22 percent with a tablet. “Consumers are increasingly looking for new ways to manage their bills, which points to the need for continued innovation by service providers across the payments industry,” said David Shapiro, senior vice president of payments at Western Union, in a statement regarding Western Union’s 2013 Money Mindset Index. “Less than one-third of payments occur via non-electronic channels, and consumers continue to use a mix of payment methods that provide enhanced choice, flexibility, control and convenience around their lifestyles and cash flow,” he explained. 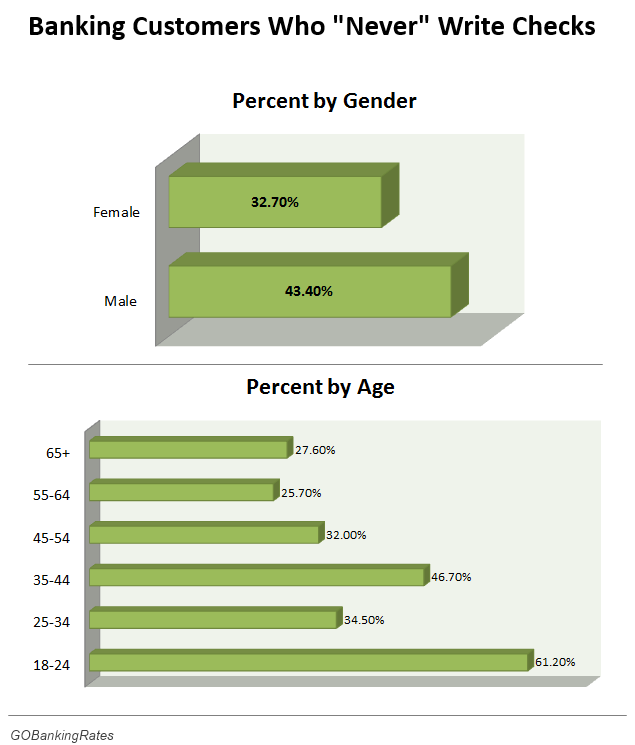 Of those who never write checks, 43.4% were male, and 32.7% were female, a spread of more than 10 points. Of those who write checks several times a month, 21.7% were male, while 29.2% were female, a spread of more than 8 points. Those making between $100,000 and $149,999 and those making between $0 and $24,999 were most likely to never write checks, at 47.4% and 46.3%, respectively. 100% of those making $150,000 or more write checks several times a month. 61.2% of respondents who never write checks were between the ages of 18 and 24 (the largest age group represented), while just 25.7% of respondents 55-64 and 27.6% of respondents 65 and up never write checks. 24.1% of respondents who write checks once a month were between the ages of 25 and 34, the largest age group represented, compared with 10.7% of respondents aged 18-24 and 11.5% of respondents aged 35-44 who write checks monthly. The second most popular response, writing checks “several times a month,” was most commonly selected by adults aged 55-64, with 38.5%. Trailing closely behind were adults aged 65 and up, with 36.5% choosing this option. The least likely to write checks several times a month were adults aged 18 to 24, at 11.7%. Polling was conducted through Google Consumer Surveys from February 19 – 21, 2014 for a total of 1,501 responses with a RMSE score of 2.0 percent.